TJ’s Seafood Shack	Seafood Galore & A Whole Lot More. 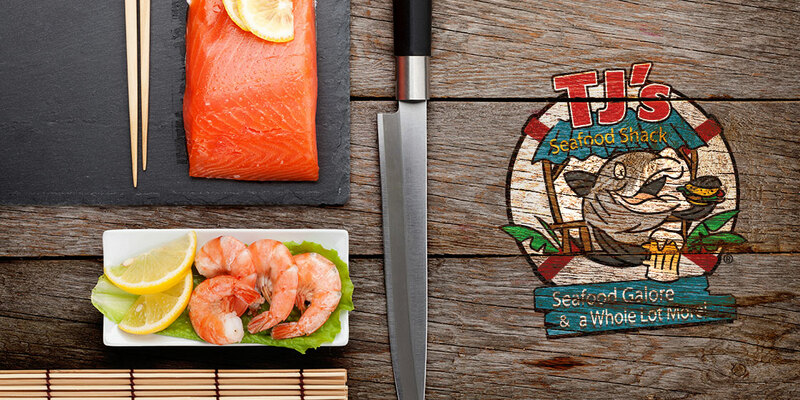 TJ’s Seafood Shack is a Central Florida favorite when it comes to serving up award-winning fish tacos, fresh seafood and some mighty fine burgers – in a relaxed, laid-back atmosphere. With a growing following and goals of future expansion, it was time to revisit their visual brand and messaging. We provided TJ’s with a fresh website presence, menu design and branding materials that all supported the vibe of the restaurant and their care-free attitude! We even designed and wrapped their food truck! Restaurant marketing is a unique animal and requires a solid strategy to bring it all together. From setting the tone and theme of the campaign to being sure you’re delivering the right information at the most opportune moment, it takes more than just a killer menu design. Thrive helped TJ’s orchestrate a fully responsive website that not only attracts organic search traffic, but also serves as a tool for customers to preview TJ’s extensive menu, find out about events and most importantly find their nearest location. All in branded experience that perfectly matches the overall look and feel we’ve developed for the restaurant. When we decided to live our dream of opening a family friendly, high quality seafood coastal shack, we envisioned a place for fun and family. The menu was hand picked from a selection of foods we have experienced in coastal areas and love ourselves. Our hard work has been recognized by the Oviedo Chamber of Commerce as Small Business of the Year Award and we were also honored to win the Taste of Oviedo Award several times. The biggest reward for us has been seeing repeat patrons come and hang out on a weekly basis. As we have grown, we have expanded our services. In looking at our next 5-10 years, we decided it was time to freshen up our brand, so we turned to Thrive. Working with Thrive was easy and refreshing. The strategy to increase our catering and events has been a great new element to our newly designed website which took on the look and feel that identified us “just as we are”. They had lots of ideas and made it easy for us. It was like they already knew us because they too love seafood and the unique tasty menu. Thrive understood the importance of staying on top of marketing and that keeping our shack busy was important, but also made efforts to enhance our events and catering services. For a restaurant, it’s important to have a menu design that is not only attractive and reflective of the overall branding and attitude of the establishment but it has to be usable. In other words, if patrons sit down and have a hard time working through the menu, their night out just became overly complicated…. We set out to provide TJ’s with menus that not only worked in tandem with the brand we created, but made ordering fun – as it should be! TJ’s Seafood Shack is one of the most friendly eateries you’ll ever visit. Owners Tim and Mary make sure everyone is taken care of and feels welcome. But that doesn’t mean we can’t have a little fun. New T-Shirts with a bit of attitude were in order! Not only does the TJ’s Seafood Shack Food Truck serve up some amazing eats in the way of award-winning fish tacos and shrimp & grits but it looks darned fine too! Thrive was challenged with delivering a design for the food truck which carried forward the look of a “seafood shack” while being instantly recognizable and memorable. We did just that and then some!